Since their domestication dogs have been Man’s companions in many different forms and as such have undergone dramatic changes. Today their task is of more urban and domestic nature and what and how much they need in food is naturally considerably different to that in their days as temple, fighting, hunting or guard dogs. The closer humans and dogs live together the greater the risk of a dog being humanised and fed like a human becomes. If we take over the responsibility of providing food for our companion we must never forget that its diet must meet a dog’s specific nutritional requirements and for each particular period in its life if it is to stay healthy. These conclusions led the NEKTON-Produkte company to develop a series of products individually formulated to meet these demands, whether for daily health maintenance, specific health problems or particular periods in a dog’s life. Vitamins are essential organic compounds promoting and regulating numerous physiological processes such as growth, health, fertility and performance. They are effective in small amounts, but as a rule animals are unable to synthesise many of these compounds at all or in sufficient quantities so that they must be included in the diet. In addition vitamins can lose their effectiveness, be inactivated or even destroyed by oxygen, light or warmth. Supplementing the diet daily with NEKTON-DOG-V is the answer in both cases. The vitamin supplement NEKTON-DOG-V has been formulated to meet the special needs of a dog’s organism. Above all the amount of every single vitamin and its effective relationship to the others have been taken into account when combining these vital substances. Every effort has been made to achieve the best possible answer to a dog’s requirements in vitamins, and in order to enable the vitamins to do their work effectively their cofactors in the enzyme systems – minerals such as calcium and magnesium and trace elements – have been added to the formula. Times of increased or sudden strain like young growth, gestation, lactation, performance, illness and age, to name but a few, occur naturally and regularly in the life of a dog, and require an extra supply of vitamins to the body. This is where NEKTON-DOG-V comes into its own. 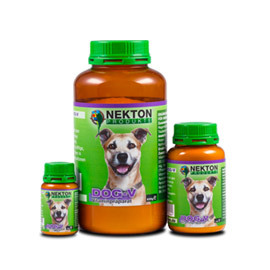 NEKTON-DOG-V should be added to the food as a supplement to cover a dog’s specific vitamin requirements for normal health or in times of stress as necessary. Formulated to meet the latest research findings on vitamin requirements, NEKTON-DOG-V is tasty vitamin supplement for all breeds of dogs. One of the first indicators of a dog’s health is the condition of its skin and coat. Nothing shows more clearly that something is wrong with your pet than when its skin is scaly and its coat dull and brittle. Of the active substances necessary to maintain the manifold functions of the skin and to produce a thick and shiny coat Biotin is particularly important. A lack of biotin can make a dog’s coat dull, dry and brittle. The dog looks unkempt and shaggy and loses an unnatural amount of hair. There can also be changes in the skin like scaly dermatitis, eczema, skin irritation, scabs and pigmentation loss. Symptoms of a biotin deficiency common to all species are retarded growth and disturbances in the nervous system. Tiredness, loss of appetite and reduced fertility can all result from a biotin deficiency. Biotin, also known as vitamin H, is part of numerous enzymatic systems in the body and is highly involved in the carbohydrate, fatty acid and protein metabolisms. Although biotin is synthesised in a dog’s intestine the amount is not sufficient. A biotin deficiency can also arise when antivitamins are present in the diet. For example, avidin, a protein of raw egg white, combines with dietary biotin and renders it unavailable to the body. Medical treatment with sulpha drugs and antibiotics can produce a biotin deficiency, too, and an excess of certain carbohydrates can reduce biotin synthesis. In view of the possible reduced availability of biotin to the body because of the above reasons, at least 80% of a dog’s biotin requirements should be covered by specifically supplementing the diet with this vitamin. If your veterinary has ruled out parasites or fungal infections as the reasons for the skin and coat disorders, NEKTON-DOG-H should be applied. 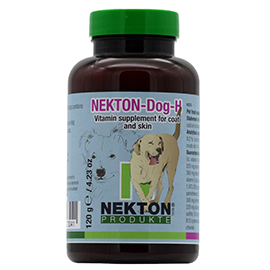 NEKTON-DOG-H is particularly effective in counteracting unnatural hair loss, dull, brittle coats, skin defects and loss of appetite when these are due to a biotin deficiency, because the extra biotin content has been combined with a balance of other vital vitamins and mineral elements to enable the proper interaction of healthy ingredients. Mineral elements are essential to the body and fulfil a number of important and diverse functions. Like vitamins, minerals are vital catalysts and activate the numerous enzymes or enzymatic systems involved in the catabolism (breaking down), metabolism (remodelling), and anabolism (rebuilding) of the ingested energy sources – proteins, carbohydrates and fats. But not only a deficiency in minerals can harm the body. Practically any element can lead to serious and complicated disturbances in the body’s make-up when an animal consumes it in large enough quantities. That is why mineral elements should be in a balanced relationship to each other and to the other nutrients in the diet. An imbalance can lead to interference in mineral absorption, excretion and binding, and minerals should therefore always be regarded and administered as a group and not as individual elements. Many of the most important basic foods for dogs lack calcium and vitamin A but contain a comparatively high proportion of phosphorus. 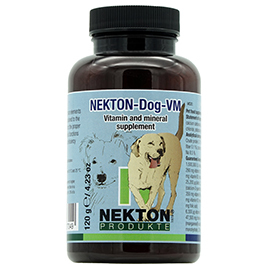 NEKTON-DOG-VM has therefore been enriched with vitamin A to counteract a deficiency. However, as the amount of food supplement normally administered daily is low, it is difficult to add enough calcium to the supplement to balance out the poor calcium – phosphorus ratio. For this reason the proportion of magnesium and vitamin D in NEKTON-DOG-VM has been increased to improve the absorption of calcium in the intestines and thus achieve a better calcium – phosphorus ratio. The nature and equilibrium of these nutrients are not only the basis for the quality of NEKTON-DOG-VM but also for its effectiveness as a vitamin and mineral supplement. The full potential of this product as an optimum source of essential vitamins and minerals is best put to use in maintaining good health in middle-aged dogs under normal conditions.